A few weeks ago I decided to give up sugar. I took a good look at my eating habits and found that I had become addicted to sugar! It’s not that hard to do, really. Sugar is in so many food items! I found that I was eating sweet things when I felt stressed or tired. 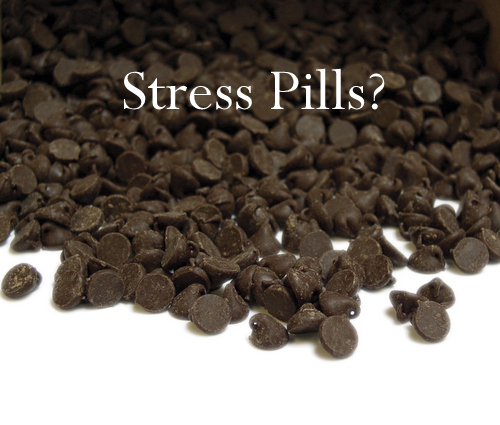 In fact, I thought of chocolate chips as stress pills. I also found that I was eating sugar out of habit. If the food was there, I’d mindlessly put it in my mouth. Then I wouldn’t be hungry for real food when meal time came. Besides eating these things which I knew were not good for me, I wasn’t feeling very good. I was tired, bloated and irritable. I wasn’t eating sugar and doing a happy dance. I was eating sugar and feeling miserable. After about a week of no sugar and very limited grains I began to feel much, MUCH better. My tummy looked flatter, I lose a couple of pounds, and I felt more positive. I was filling up on more veggies and protein and feeling really good. I loosened the reigns a little and ate a few treats. And my eczema came back. For the time being I must not eat sugar. It’s not good for me. It’s not really good for anyone. But perhaps you can handle more than me. This is a tough habit to break. I figure I’ve been eating a decent amount of sugar for most of my life, so it’s going to take a while to get over it. And I bet you will feel great! Is cutting back or eliminating sugar is something you are working on? I’m cutting back but not cutting it out completely. I am much more picky about when I decide to indulge. Other than natural sugar in fruits (which I won’t give up!) my biggest source of sugar is an occasional treat and my morning coffee and gels used in athletic training (which is rare now that I’m back to off season). I tried cutting it out of my coffee and decided I just don’t want to. I cut way back on creamer, etc and for now that is good enough. I’ve lost 125 pounds and kept off all but about 10 of that for over 8 years. I have learned that striving for “perfection” is a good recipe for disaster, depression, feelings of failure and a jumping off place to go back to bad choices. Now I concentrate more on an 80/20 plan or what someone I know calls “striving for B+” and so far, it has worked really well for me. Best wishes on your sugar journey and for continued success! Thanks for your encouraging words. And congratulations on your 125 pound weight loss as well as your victory over sugar! I think the 80/20 rule is awesome. That is where I plan to go once I am feeling stronger. Sugar still has too much of a pull for me. I don’t think it is necessary to give up everything and love that you decided you just don’t want to give it up in your morning coffee. We don’t want life to be miserable! I have cut out sugar completely! I have sever excema on my hands due to a sugar allergy. I got lazy and was eating whatever I wanted for quite some time. Needless to say, I paid the price and my hand looks and feels terrible. I actually began the sugar free ‘journey’ about 4 weeks ago and I am just now begining to heal. I lost 5 pounds in the first week! I went to the Evergreen State Fair last week twice and I left both nights not wanting to have sugar filled fair food. I was very proud of myself. I even had salad and corn on the cob for dinner. Yay for your salad and corn on the cob dinner! That’s great. And a 5lb loss the first week . .. woo hoo! It’s interesting that you see a connection better eczema and sugar, too. Thanks for sharing your journey with me. I hope you continue to do well! I just love your determination! You are doing great. It’s always sad to find sugar hidden in something we are enjoying (or eating/drinking regularly). On my grocery shopping trip yesterday I could not believe how sugar was thrown into everything! I wanted to buy some natural hot dogs – sugar. Yogurt – sugar. Ketchup – sugar. It’s crazy! Keep up the great work. And thanks for the Bible verse. I love that one! Good luck on your chicken search. I hope you find someone. I don’t trust the store bought eggs either.